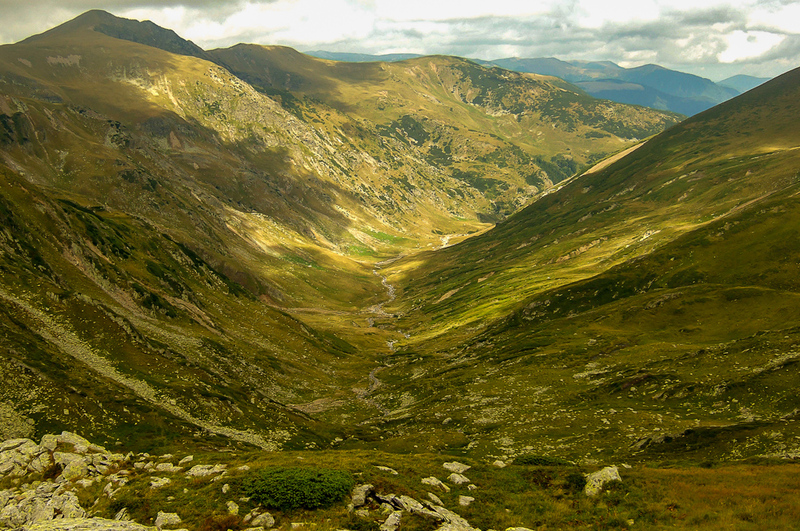 The Bucegi Mountains form a horseshoe shaped ridge oriented from north to south. 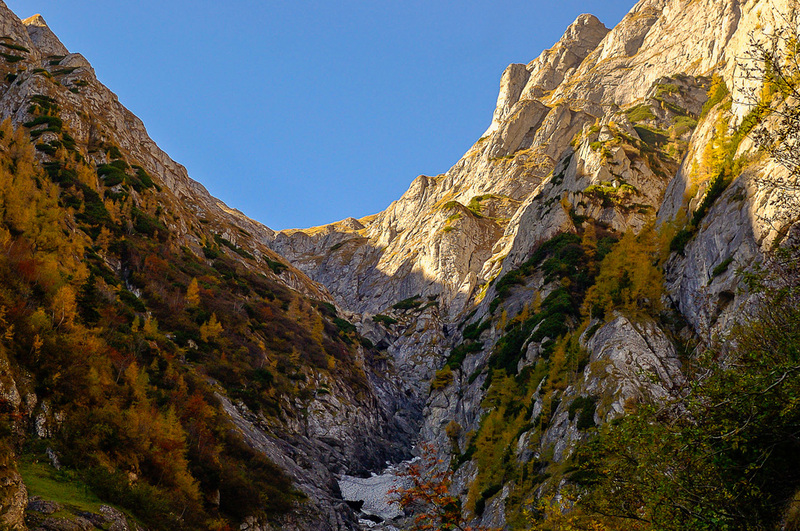 Its morphology is given by a hanging plateau deeply carved by glaciers and displays a wide range of geographic units: ice valleys, gorge carved in limestone, steep walls made up of conglomerates and not the least interesting stone formations created by the aerial abrasion resembling human features – “Sphinx” or the “old ladies”. The mountains morphology is done by a hanging plateau deeply carved by glaciers and by Ialomita River with its tributaries. Whole structure dips towards the south, starting from an altitude of 2507m (Omu Peak). The outer rim of the horseshoe comprises of near-vertical cliffs which drop up to 1000m, while the inner rim is generally gentler. Towers and narrow cricks adorn the abrupt margins, and glacial circle valleys proceed through small plateaus where glaciers developed in former times. Waterfalls constitute another interesting feature of the mountains. Inside the "horseshoe", Ialomita river cut out gorges and caves through limestone and conglomerates. 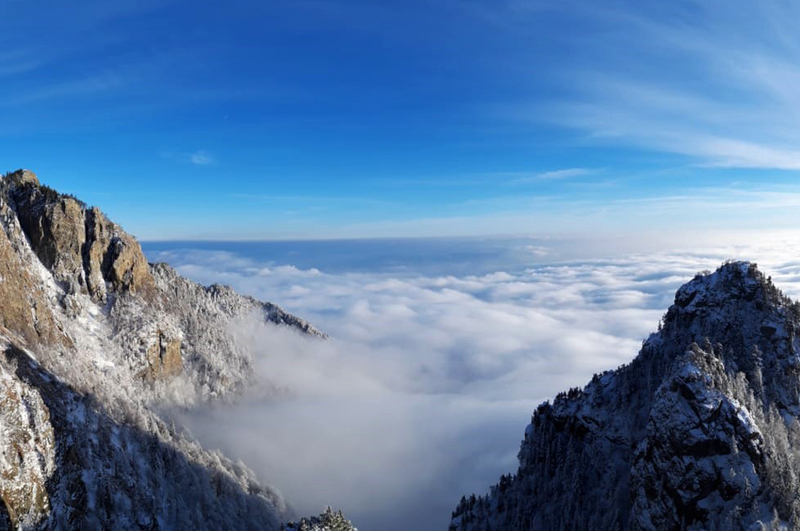 The most recent nature's artwork is the aeolian abrasion over the isolated sandstone cliffs from the top plateau, giving the "Sphinx" and "Babele" (Old Ladies) sculptures. The mountains were declared National Park in 1990. 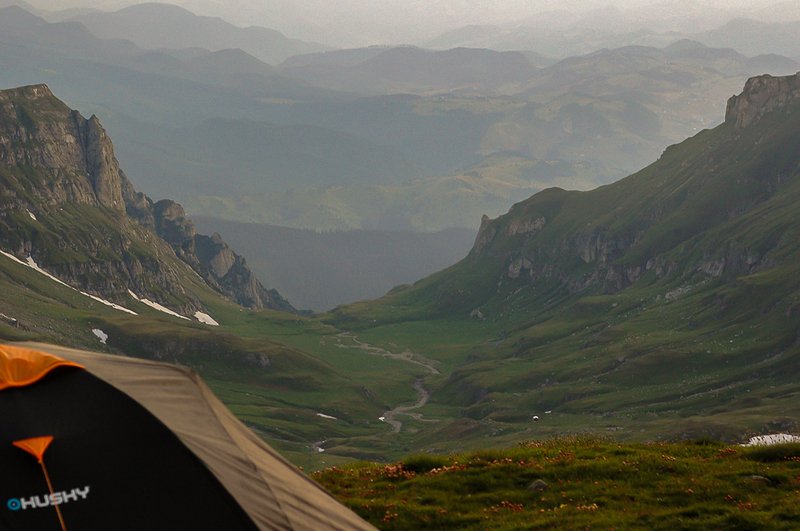 Of the 50 types of forestry formations existing in Romania, 12 (24%) consist in the Bucegi National Park. 60% of the Natural Park’s surface area (19.633 ha) is covered by forests. The area includes a concentration of 1245 types of plants. 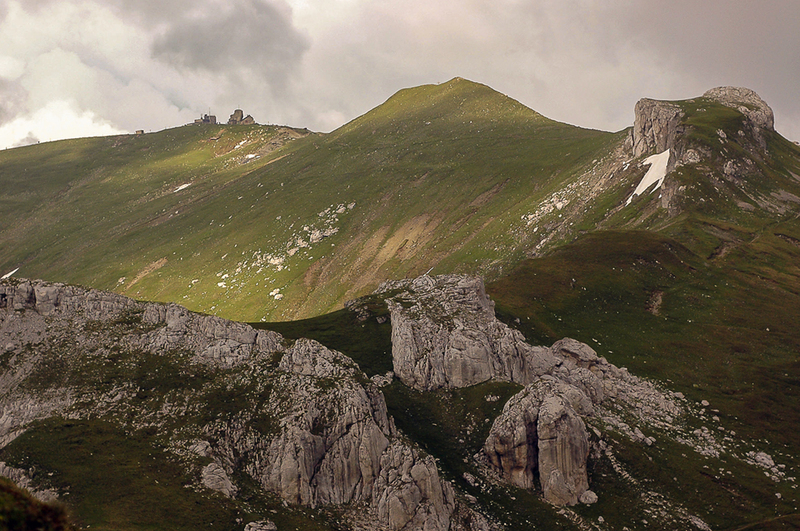 Given the average density of plant species at the national level the one of the Bucegi region is approximately 250 times larger. The various wildlife species as the Edelweiss, Wild Mountain Rose, Alpine Swifts, Capercaillie, Chamois, Bears and Wolves completes the attractions of the place. The grade of the tour is ranked as “normal hiking” – T2 from Swiss Alpine Club (see please http://de.wikipedia.org/wiki/SAC-Wanderskala ): apparent good hiking and good walk-way. Partly steep. Possible danger of falling hiking shoes recommended. A little slip resistance required. Basic orientation skills. Day 1. Bucharest – Sinaia (120km). Hiking: Sinaia (1200m) – Bucegi ridge (2000m) – Ialomita River (1600m). Duration: 5 hrs; length: 8 km; climb: 800 m, descent: 400 m.
After leaving the dirt road close to Poiana Stinii chalet we start an intense hike through the forest for about 2 hrs. Once we reach the alpine the effort becomes gently and we have the chance to admire Prahova valley he have just left behind. Bushes of junipers and wild flowers surround us all the way on the summit plateau. After crossing the suspended plateau of Bucegi Mountains we begin the descent thru the inner Ialomita River. Day 2. Ialomita river (1600m) – Babele chalet (2200m) – Omu chalet (2500m) – Diham plateau (1300m) – Busteni (900m). Duration: 10-11 hrs; length: 12 km; climb: 900m; descent: 1200m. A long endurance day which offer the option to go uphill to the top and then to cross a glacier valley down to the mountain foothills. We start early morning to hike back to the suspended plateau up to the Babele chalet (cable car option to take as a possibility to shorten the route). 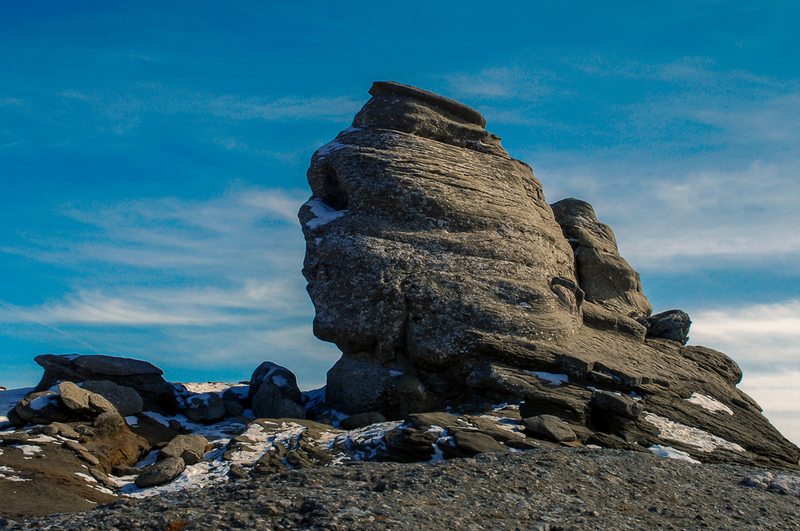 We admire here these two interesting rock formations fashioned by the wind erosion, Babele (“The old ladies”) and Sphinx, then we continue to gently hike for 2 hrs up to the summit, Omu peak – 2507m. Superb panoramic view over the surrounding mountain ridges, Piatra Craiului to W, Postavarul to N and Ciucas to far E. Short break for lunch. We start the descent, then. The trail goes through an impressive glacier valley down to a meadow where the mountain side we have just walked is visible. Accommodation in 3* mountain chalet. Day 3. 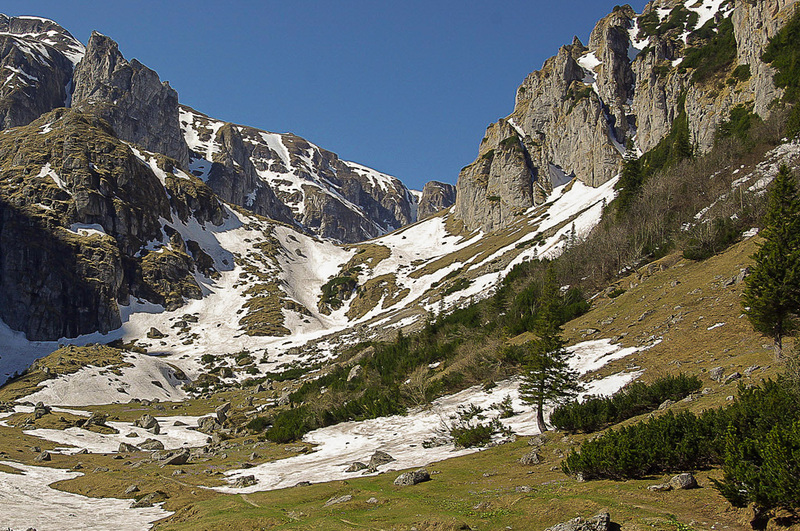 Diham plateau (1300m) – Busteni (900m). Duration: 3hrs; length: 6km. Climb: 100m; descent: 500m. Busteni – Bucharest (140km). We start the day by a gentle walk up to a saddle, then the trail goes along the foothills, intersecting a serious of creeks form the eastern side of Bucegi Mountains. Return to Bucharest.